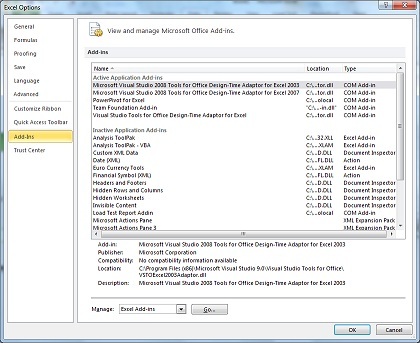 Excel 2010 provides some more advanced statistical and engineering analysis tools that are not installed by default. 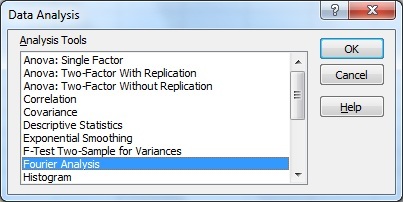 If you’re interested in using Excel for statistical analysis, you should install the Analysis Toolpak for Excel 2010. 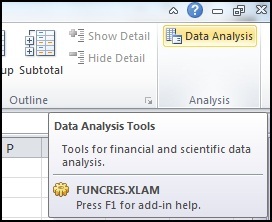 To confirm whether you already have the Analysis Toolpak installed, open the Data tab on the Excel ribbon. 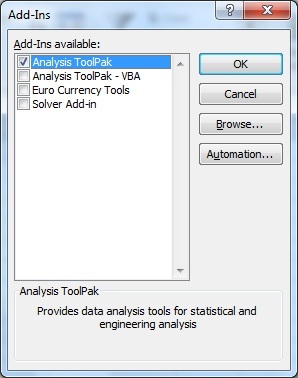 If the Analysis Toolpak is installed, you should see a Data Analysis button on the Ribbon, like the one shown here. If the Analysis Toolpak is not installed, go to the File tab and select Options in the left column. In the Excel Options Window, select the Add-Ins category on the left. Near the bottom of this window, you see Excel Add-ins already selected in a drop-down menu labeled Manage. Click the Go button next to this drop-down. The Add-Ins dialog will open. Here, you can select the check box next to Analysis Toolpak (and any other add-ins you want to install). Click OK. The Data Analysis button (as shown in the first screenshot) should now be available on the Excel Ribbon, under the Data tab. This button will open the Data Analysis dialog, which offers access to a variety of analysis tools.